The Wild Meadow is an area of the cemetery where loose ashes may be buried or scattered. Instead of a traditionally headstone or plaque, the person may be remembered by planting of up to six native bulbs. There is a focus on preserving the natural beauty of the wild meadow and encouraging wildlife. 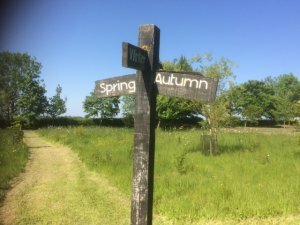 The Wild Meadow consists of four sections know as Spring, Summer ,Autumn & Winter and relatives can decide which area of the Meadow they wish to use. No memorials are permitted in this area of the cemetery. There is no charge for the dispersal or scattering of loose ashes however, permission is required from the Parish Clerk.